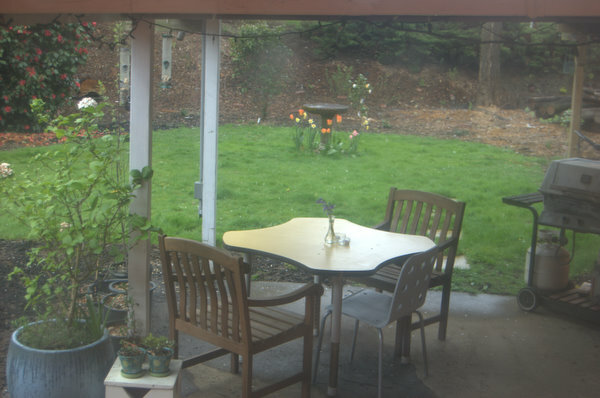 View of the yard and patio from the kitchen window. 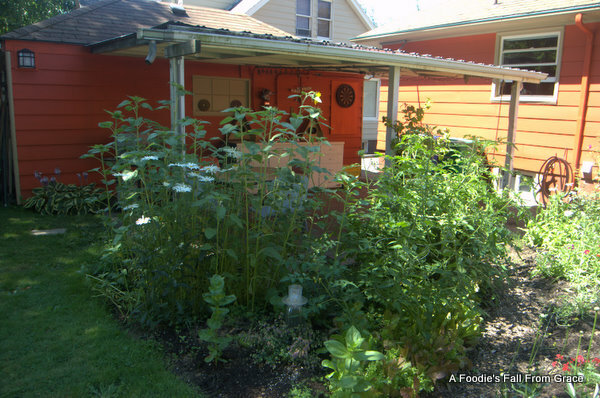 Another view from the patio -- massive tomato jungle on the right. View into the patio -- I'm standing now in the middle of the yard. Chocolate Cosmos -- amazing! Everyone should have these. They really do smell like chocolate. These are growing at the base of the native crabapple (malus fusca), newly planted in the middle of the yard. 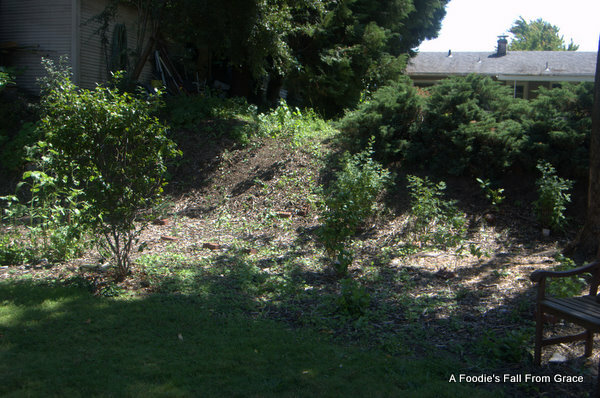 Despite there being a metric buttload of new plants on the slope, it's taking too long to fill in and looks like/is a bed of weeds with cherry bark spread throughout. There are two new camellias in here, the Margie (center-right), and another (on the left) that is supposed to be a fall bloomer. 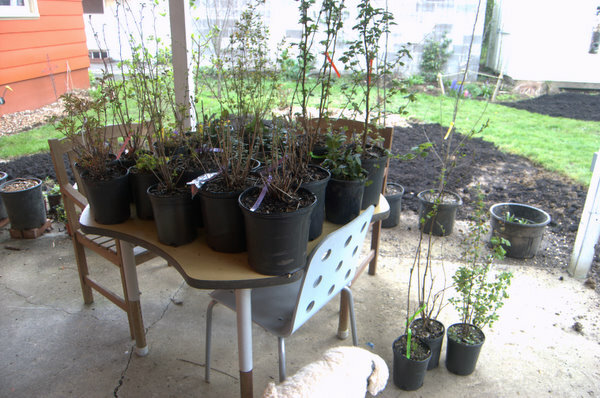 Also many natives (salal, sword ferns, huckleberry, serviceberry, ninebark, nootka rose, woods rose, Indian plum, salmonberry, and another native crabapple). 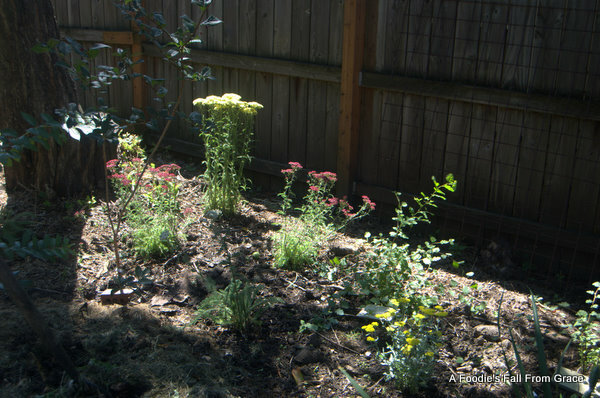 To the right of the slope is this new yarrow garden with four different colors/varieties, near two native twinberries, all of which I'm loving. Yarrows are known to spread, so I'm hoping they just take over here and completely fill in. This is near the native iris I discovered a few weeks ago. 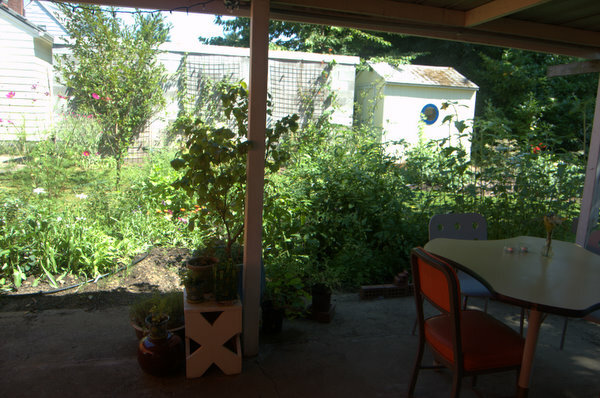 View of the dahlia garden on the right and the awful gray wall of our neighbor's carport. The bamboo contraption is.... well, something The Man built. I'll say no more about that. But it does hold the bird feeders rather nicely. 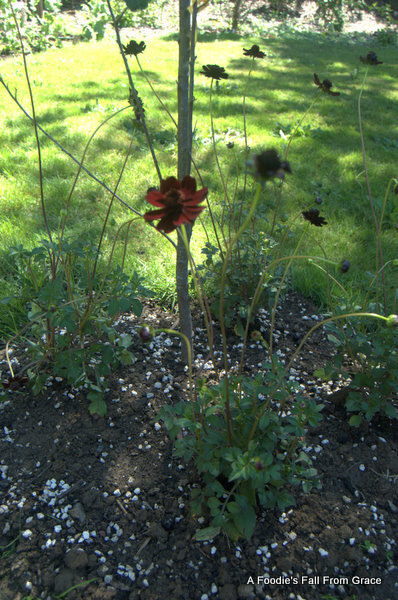 Another view of the dahlias. This is all blooming like crazy now and is AWESOME. Mixed in there are some germanders, catmint, native currants, teucrium azurium, oriental poppies, nasturtiums, western azalea, and tolmeia menziesii "Taft's Gold," which is a native evergreen ground cover. 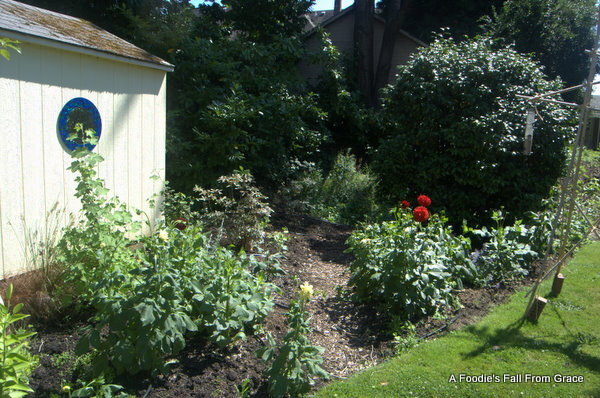 Dahlia beds with the existing camellia that we love. Next I’ll post some photos about some of the individual plants that have been rocking my world. 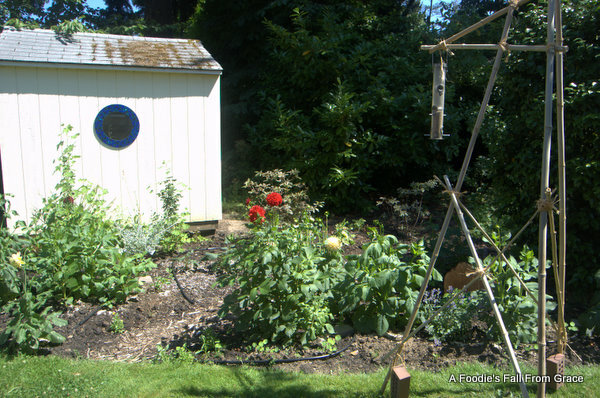 (Note: this blog morphed into a gardening blog for the month of August). I read back through some of my creative writing work from 1997. At the time, I had been writing pretty seriously for a few years and I was definitely very committed to writing and improving. So, the pieces I reviewed were not my very first attempts at writing. What I discovered was that while the writing was fine, it was very much a beginner’s effort, of someone still learning how to write well. In other words, 15+ years into my writing career, such as it is, I can now do way better. It was so lovely to see how far I’ve come. Yea! Next is that I gave someone a recipe this morning for sorrel soup that I realize now was pretty vague. But this is how I’m cooking these days. I followed recipes from roughly ages 20-35. But for the past few years, I’ve gotten a lot better at whipping up something from whatever I have around, based on my understanding of how things taste and what goes with what. Essentially, I learned how to cook by following recipes, and now I am reaping the rewards of that learning in the form of being able to cook without recipes. What a milestone! I’ve always been one for the long haul. I feel like I never truly know something unless I’ve been doing it for a very long time. It’s nice to feel like I have been doing a few things for a long time and I now have some chops to show for it. If this is what it’s like to be 40, I’ll take more! On a related note, I find that I gravitate towards cookbooks that try to teach you how to cook instead of just giving you recipes to follow. Good examples include Sally Schneider’s books and Julia Child’s Mastering the Art of French Cooking. All of those books are framed on the principle of “master recipes” from which you then make other things (Schneider calls this improvising). This approach/philosophy really works for me. And, of course, with SCD, I have to be really flexible and creative with modifying recipes anyway. Oh, and another thing. I came home from work one day this week and I’d had a really rough day, at the end of which, I basically obliterated everything I’d worked on all day and was not sure I could get it back. I had to leave work late not knowing if I’d be able to recover all my work the next day. When I got home, I started making chicken curry for dinner. Somewhere in the middle of making it, I realized how profoundly grateful I am that I enjoy cooking. I find it relaxing and engaging, like meditating, and I know that so many people just don’t. For them, it’s a big, boring chore–like doing the laundry or mowing the lawn–and there is no pleasure in the act of cooking. I am so grateful that I do love it, especially given that I’m eating SCD, which is fairly challenging. I really feel for the people that come to SCD with no cooking skills and no interest in cooking. What a tough mountain to climb. So, here’s that sorrel soup recipe, for what it’s worth. Basically, I bring the stock to a simmer and then add the sorrel. Simmer for 15-20 mins or so. Then run this through the blender and add a few shavings of nutmeg, ground white pepper, and salt to taste, and optionally, a cream of your choice (like almond or coconut milk). Variations include sauteeing some leeks beforehand and then adding the stock to that and going from there. Or caramelizing some onions first and going from there. You get the idea. And now, back to my coq au vin simmering away on the stovetop and my firm belief that any dish that starts with frying bacon in butter is going to be good. 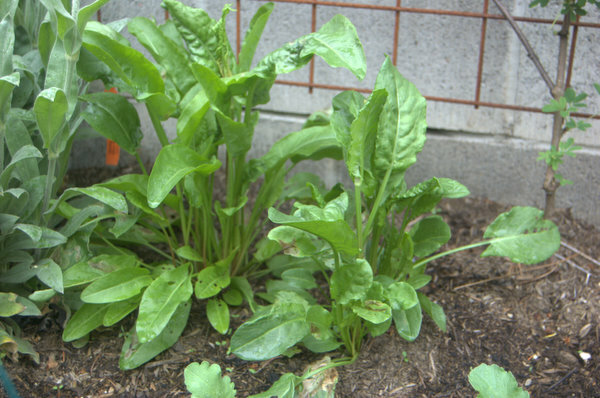 Sorrel is one of the things that grows really well in Portland, almost too well. I separated my sorrel-jungle in February, and here it is now trying to take over again. Try to ignore the non-native geraniums on my front porch and focus on the plaque. 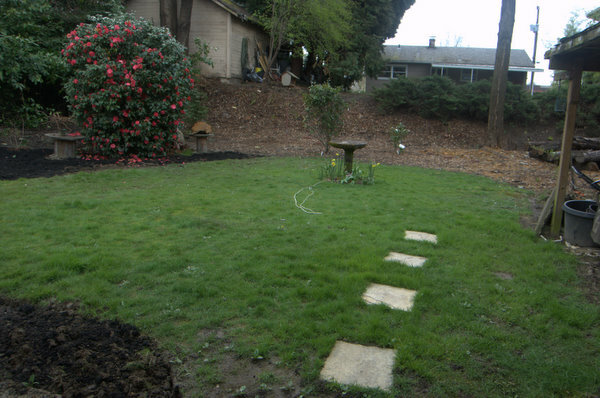 Here are some pics of the backyard projects I promised a while back. I’m hoping that what you see here (or don’t see, rather) will be full of summer flowers by August. 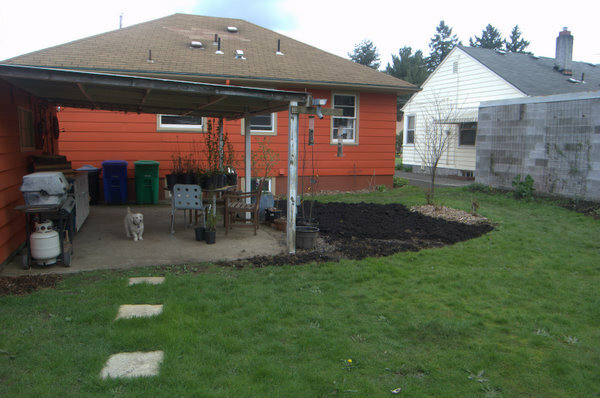 Basically, The Man dug up new beds off the patio and extended the beds next to our neighbor’s carport (the grey cinderblock wall). 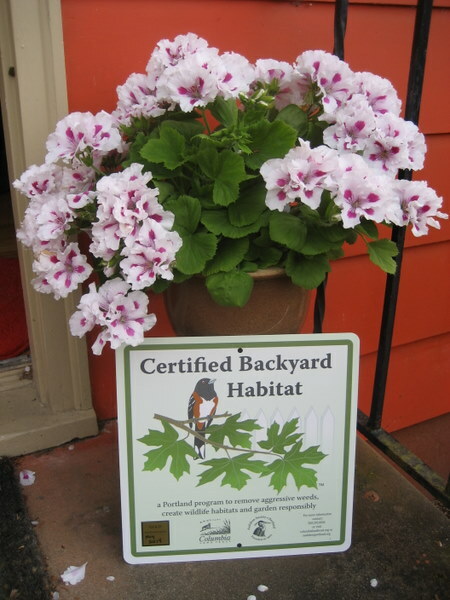 We are Backyard Habitat program participants, so the focus is on native plants to attract birds and bees. I’ll update again in August. A bunch of native plants from the plant sale. We got all of these in the ground a few weeks ago. This is the backyard facing south. That slope back there was full of ivy just a couple of months ago. 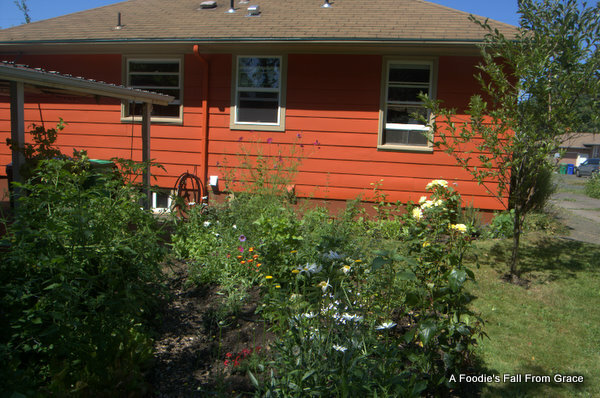 Now full of native plants. Facing north, towards the house. Note the new bed off the patio. 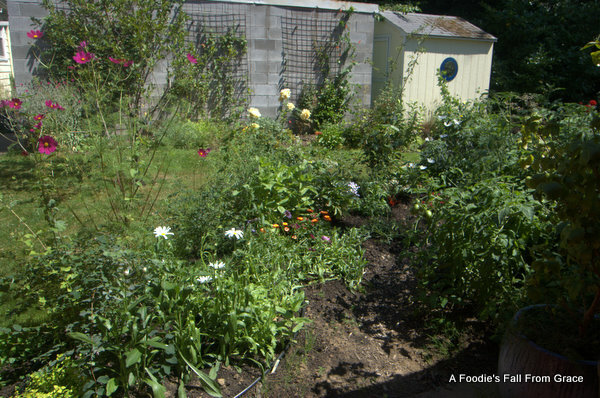 I've put some snowberry in here to be a privacy screen and also some zinnias and inside-out flowers. This is facing west. 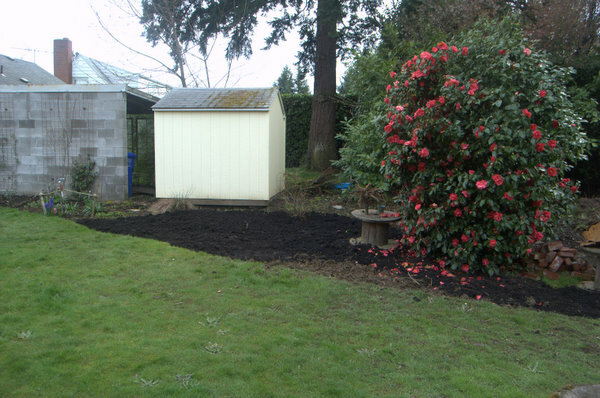 These two new beds will be intersected by a wood-chip path and be dahlia beds. Also included here are native azaleas and more snowberries. The bed next to the wall is full of salad greens and herbs. Close-up of the slope. 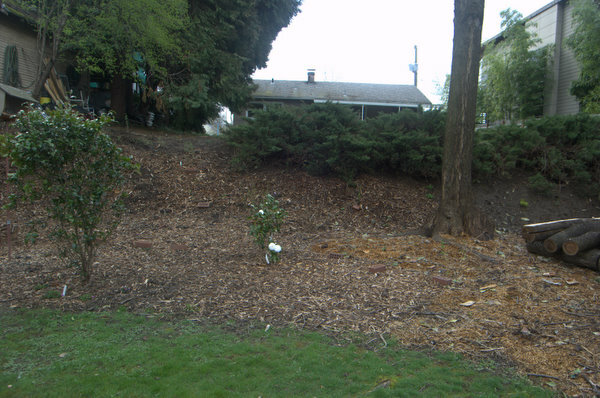 It's hard to see here, but it's now planted with sword ferns, red flowering currants, ninebarks, salal, thimbleberries, salmonberries, twinberries, nootka roses, a pacific crabapple, woods roses, oxalis, and some other natives I can't remember. This will probably be a maintenance nightmare in five years, and I look forward to having that problem! It looks pretty hideous today, although not as bad as the ivy. The patio. 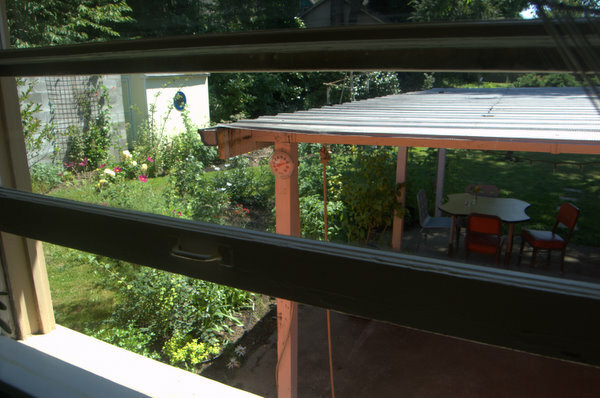 The dream is to have a nice garden full of flowers all summer to look at from here. Grow, plants! Faster! Where am I going to put all of this?! Oh yeah, half the backyard is ripped up! If you want to see some of these, there is the most awesome database here at OSU’s plant program. Some of these natives I really, really love. Snowberry, salal… well, actually, all of them are just lovely. 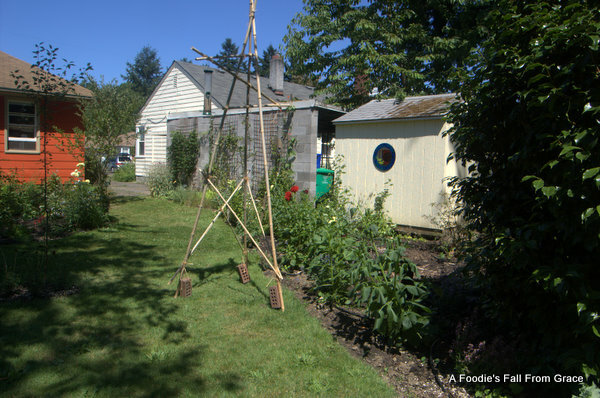 At the moment, the current things we’ve planted just look like twigs in the ground. I’ll try to take some pictures for you this weekend. There’s not much to see, but I’m hoping for a dramatic before/after for next year. On the vegetable agenda for this year are lettuces. I wrote down all the varieties that did well last year, plus the things that didn’t do well, and decided I’m not the kind of gardener who needs to prove herself. I just want to plant seeds in the ground and eat salad six weeks later. If that happens, I’m a huge success. With that said, here are the things I’m planting. 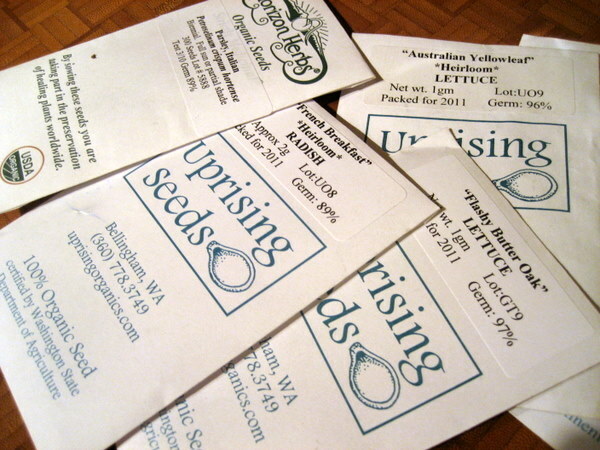 We get the seeds from Uprising Seeds. The downside of the season: allergies. I’ll write about that soon. Until then, happy garden planning.